The leader of Yabloko Grigory Yavlinsky said that it is necessary to create a sole democratic front in the RF. 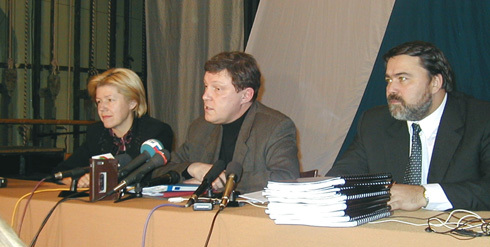 Photo: Elena Mizulina, Grigory Yavlinsky and Igor Artemyev at a press conference in Yaroslavl on December 23, 2000. “Both we and the Union of Right-Wing Forces will do our utmost in the near future to take the first steps in the creation of a single democratic front in Russia,”, said Yavlinsky at a press conference in Yaroslavl on December 23, 2000. Yavlinsky recollected that in April 2000 Yabloko set forth an initiative to hold a conference in Moscow, involving all the democratic parties and a number of public organisations to discuss the situation in the country and “the general agenda for joint efforts”. 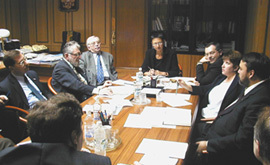 According to Yavlinsky, a democratic conference may be scheduled for February – March 2001, and should be held on a regular basis. “This will serve as the foundation for the joint democratic front,” added Yabloko’s leader. In Yaroslavl Yavlinsky also participated in a discussion on the prospects of the Yabloko party and the underlying principles for its coalition with the Union of Right-Wing Forces. The discussion was organised by the Yaroslavl regional branch of Yabloko.